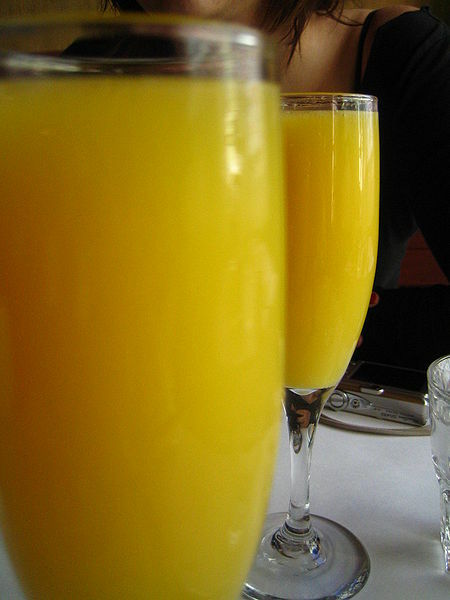 A Mimosa is a cocktail-like drink composed of 1 part champagne or other sparkling wine and 1 part thoroughly chilled orange juice. It is traditionally served in a tall champagne flute with a morning brunch or to guests at weddings. The origins of the mimosa are somewhat murky. Allegedly, the drink was invented at the Paris Ritz in 1925, although it bears a striking similarity to another cocktail, the Buck's Fizz, which was introduced in England in 1921, and named after the club in which it was first served. The Buck's Fizz is also traditionally made with champagne and orange juice, although grenadine is sometimes added as well. The name introduced in 1925 comes from the flowers of the mimosa plant, which are yellow and appear slightly frothy from a distance. Outside the USA the mixture of orange juice and champagne is still referred to as a Buck's Fizz, while the term mimosa is used in the United States. Ensure both ingredients are well chilled, then mix together into the glass (champagne flute). Serve cold, stirred not shaken, garnished with cherries, or raspberries. While most bartenders agree that the mimosa should be served in a chilled champagne flute, the exact proportions of the drink may vary. Some recipes call for a measurement of three parts champagne to one part orange juice, while others prefer a half and half ratio. Both ingredients should be chilled, and some bartenders also serve the drink over ice. Others hotly contest the use of ice, arguing that it dilutes the drink unfavorably. The official International Bartender's Association recipe calls simply for equal parts orange juice and champagne, with no mention of ice. Mimosas are usually served without a garnish, although a twist of orange peel might be considered appropriate. Though mimosas are traditionally served with champagne, sparkling wines can also be used. For guests who do not wish to consume alcohol, sparkling waters such as Perrier are also acceptable. In either case the drink should still be served in a champagne flute so that the bubbles last longer. Common mimosa variations are created with a small amount of an additional liqueur, generally with fruit flavors such as peach or raspberry, and often served with one or two pieces of the fruit (such as dropping two raspberries in the drink).